Getting out of bed, walking, rising from a chair and climbing stairs all require strong leg and hip muscles. Many of us take our lower body strength for granted until these activities of daily living become increasingly more difficult. The great news is research shows that strength and mobility can be regained at any age! Last month we talked about ankles being the “mobility bosses” since all mobility and balance begins the moment our feet hit the ground. Moving up the kinetic chain of mobility, let’s take a look at the thigh muscles that surround the knees, including the quadriceps and hamstrings. The quadriceps are the four muscles found at the front of your thighs while the hamstrings are a group of three muscles found at the back of your thighs. These muscles work together to extend (straighten) the knee and to flex (bend) the knee. But wait there’s more! Our lower body muscles work together as a complex system where most muscles are responsible for more than one type of movement. The muscles surrounding the hips provide a great amount of stability for the pelvis and mobility so we can bend down, stand up, turn around and move from side-to-side. The hips are a ball and socket joint that allow us to move in many directions. Let’s take a closer look at the muscles of the hips. The muscles on the back side include three large thick muscles called gluteals (gluteus maximus, gluteus medius and gluteus minimus). The primary function of the gluteals is to extend the thigh when rising from a chair. Gluteals also help to keep the pelvis level as we shift weight from one leg to the other while walking or climbing stairs. The gluteals muscles are also “abductors” that move the thighs out to the sides. Now that our legs are outward, how do we bring them back in? Glad you asked! The main action of the inner thighs or “adductors” is to bring the legs together or inward. Looking at the front of the hips, we have a group of muscles called the “hip flexors.” As the name so aptly suggests, they flex the hip or pull the thigh forward when walking or climbing stairs. There are also several small muscles that travel from the inside of the pelvis across the back of the hip joint that stabilize the hip and allow the leg to rotate outward like when swinging a golf club or dancing. This group of muscles is called the “external rotators of the hips.” Conversely, to rotate the leg inward, we have “internal rotators.” The mobility muscles all work in concert together, contracting and relaxing so we can perform activities of daily living smoothly and enjoy life to the max! Here are a five seated exercises and one standing exercise to help keep you strong, mobile and independent while also reducing the chance of falling! Use your own body weight to start and when you are looking for a greater challenge, add resistance bands. Perform 10 repetitions any time you are sitting in a stable chair with your hips aligned with or slightly higher than your knees. For an added challenge, hold the exercise for 3-10 seconds. When adding resistance, do the exercises 2-3 days per week on non-consecutive days to allow for adequate rest and recovery. Extend one leg as straight as possible and lower; alternate legs. Pull both heels behind the knees. Lift and lower one knee, alternate. Challenge: Press the knee of the opposite leg down as the other knee lifts. Slide feet and knees out to the sides, squeeze back to center. Keep knees aligned with hips (place both fists between knees) then slide feet in and out. Holding on to the back of a stable chair for balance, stand upright with good posture and extend one straight leg backward, alternate. The key to good mobility is to stay active and exercise in all the directions your body can move in. Perform activity and exercise in a comfortable, pain-free range of motion. 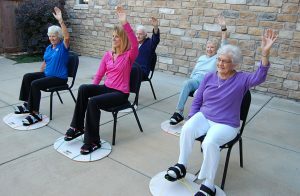 For more variety and easy-to- do exercises, see www.ElderGym.com. Choose to live long and strong! In addition to being an ACE-certified Senior Fitness Specialist, Cate Reade, MS, RD is a registered dietitian with a master’s degree in Nutrition and Physical Fitness from NYU. She has been teaching, writing and prescribing healthy eating and exercise programs for over 25 years. 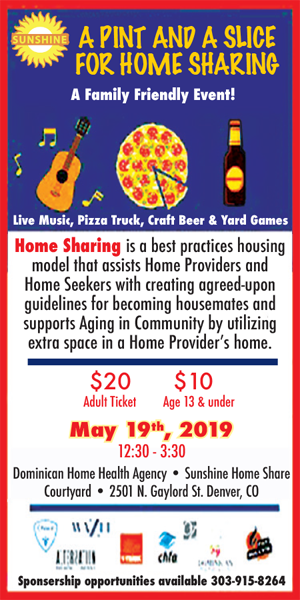 She is delighted to be helping seniors regain strength and mobility as the CEO of Resistance Dynamics and inventor of the MoveMor™ Lower Body Trainer. 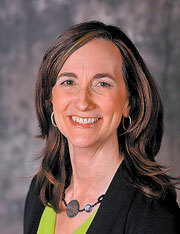 Contact Cate to speak at your next community event by calling 720.244.4248 or visit www.MoveMor.com.